The use of data is the basis for conducting a variety of activities and making decisions on operational and strategic levels in different organizations [1Haug A, Zachariassen F, Van Liempd D. The costs of poor data quality. Indust Engg Manag 2011; 4(2): 168-93.]. While high quality data is essential for the success of organizations, the drawbacks of low quality data are increasingly experienced by different companies and institutions [2Moges H-T, Dejaeger K, Lemahieu W, Baesens B. A multidimensional analysis of data quality for credit risk management: New insights and challenges. Inf Manage 2013; 50(1): 43-58. [http://dx.doi.org/10.1016/j.im.2012.10.001] ] and have great impacts on their efficiency and effectiveness [3Carey M, Ceri S, Bernstein P, et al. Data-centric Systems and Applications 2006.]. Generally, data quality refers to the extent that the data fulfill users’ expectations and suit its intended purposes [4Sebastian-Coleman L. Measuring data quality for ongoing improvement: a data quality assessment framework 2013.]. Data quality is also an important issue in the field of healthcare and healthcare information technology [HIT] [5Haux R. Health information systems - past, present, future. Int J Med Inform 2006; 75(3-4): 268-81. [http://dx.doi.org/10.1016/j.ijmedinf.2005.08.002] [PMID: 16169771] ]. In fact, the quality assurance of the data in healthcare systems is an emphasis on the continuity of the quality of care [6Almutiry O, Wills G, Alwabel A. Toward a framework for data quality in cloud-based health information system. International Conference on Information Society (i-Society), 24-26 June 2013: IEEE. ], and the technologies that support clinical care need accurate and complete data [7Porter SC, Forbes P, Manzi S, Kalish LA. Patients providing the answers: narrowing the gap in data quality for emergency care. Qual Saf Health Care 2010; 19(5): e34. [PMID: 20511242] ]. Among different medical specialty, the quality of data is of critical importance in the field of emergency medicine. The unique characteristics of emergency care services, such as high turn-over, repetitive assignment of care from one provider to another, high fluctuation in the number of patients, and the attendance of unfamiliar inpatients in the emergency departments may increase the possibility of making errors in this setting [8Farley HL, Baumlin KM, Hamedani AG, et al. Quality and safety implications of emergency department information systems. Ann Emerg Med 2013; 62(4): 399-407. [http://dx.doi.org/10.1016/j.annemergmed.2013.05.019] [PMID: 23796627] , 9Ayatollahi H, Bath PA, Goodacre S. Information needs of clinicians and non-clinicians in the emergency department: A qualitative study. Health Info Libr J 2013; 30(3): 191-200. [http://dx.doi.org/10.1111/hir.12019] [PMID: 23981020] ]. As a result, emergency medicine is regarded as a challenging field of healthcare services, and the generation of high-quality data is one of the main concerns for performance measurement in this setting [10Esmailian M, Nasr-Esfahani M, Brahimi AS. The quality of patients’ files documentation in emergency department: A cross-sectional study. Iranian Journal of Emergency Medicine 2014; 1(1): 16-21.]. The practice of physicians in the emergency departments is accompanied with multiple pauses that are related to conducting various duties and simultaneous communication between healthcare providers [11Mohammed SA, Yusof MM. Towards an evaluation framework for Information Quality Management (IQM) practices for health information systems--evaluation criteria for effective IQM practices. J Eval Clin Pract 2013; 19(2): 379-87. [http://dx.doi.org/10.1111/j.1365-2753.2012.01839.x] [PMID: 22502634] ]. From the emergency medicine perspective, a pause in the process is an indicator for the potential error in the cycle of data documentation. Therefore, the regular assessment of data quality is crucial to avoid the adverse effects of using low quality data in the process of decision making [12Xie S, Helfert M. Assessing information quality deficiencies in emergency medical service performance. Proceedings of international conference on information quality Cambridge. 2010.2010., 13Liaw S-T, Chen H-Y, Maneze D, et al. The quality of routinely collected data: Using the “principal diagnosis” in emergency department databases as an example. Electr J Health Inform 2012; 7(1): 1.]. Moreover, according to Obermeyer et al., compared to high-income countries, in which clinical and emergency care have dramatically improved during the last decades, in developing countries there is still a lack of data from the field of emergency medicine that has made it difficult to make new investments in emergency care. Hence, any improvement to emergency care in these countries will require advances in data collection methods and data quality. Tanzania and South Africa are among the countries which have started working on emergency data quality [14Obermeyer Z, Abujaber S, Makar M, et al. Emergency care in 59 low- and middle-income countries: A systematic review. Bull World Health Organ 2015; 93(8): 577-586G. [http://dx.doi.org/10.2471/BLT.14.148338] [PMID: 26478615] ]. To assess data quality, it is pivotal to have a common grasp of its concept. Several investigators have pointed out a lack of a common definition for the data quality in healthcare. However, data quality is defined frequently as fitness for use, i.e. the extent the data can be used for its user purposes [15Watts S, Shankaranarayanan G, Even A. Data quality assessment in context: A cognitive perspective. Decis Support Syst 2009; 48(1): 202-11. [http://dx.doi.org/10.1016/j.dss.2009.07.012] ]. It is also suggested that data is suitable for application when it can provide he required information for its users [16Faridaalaee G, Boushehri B, Mohammadi N, Safari O. Evaluating the quality of multiple trauma patient records in the emergency department of Imam Khomeini hospital in Urmia. Iran J Emerg Medi 2015; 2(2): 88-92., 17Canadian Institute for Health Information. The CIHI Data Quality Framework 2009.]. Data quality assessment has a great impact on data quality development. During the assessment process, the main reasons for data deficiency and errors and the necessary control processes will be identified which eventually may lead to improve the quality of data [18Pipino LL, Lee YW, Wang RY. Data quality assessment. Commun ACM 2002; 45(4): 211-8. [http://dx.doi.org/10.1145/505248.506010] ]. Since data quality is a multidimensional concept, it is important to pay more attention to the methods of data quality assessment [19Batini C, Cappiello C, Francalanci C, Maurino A. Methodologies for data quality assessment and improvement. ACM Comput Surv 2009; 41(3): 16. [http://dx.doi.org/10.1145/1541880.1541883] , 20Chen H, Yu P, Wang N. Do we have the reliable data? An exploration of data quality for AIDS information system in China. Stud Health Technol Inform 2013; 192: 1042. [PMID: 23920816] ]. According to the literature data quality assessment can be performed using quantitative and qualitative methods [4Sebastian-Coleman L. Measuring data quality for ongoing improvement: a data quality assessment framework 2013., 21Chen H, Hailey D, Wang N, Yu P. A review of data quality assessment methods for public health information systems. Int J Environ Res Public Health 2014; 11(5): 5170-207. [http://dx.doi.org/10.3390/ijerph110505170] [PMID: 24830450] ]. Objective and subjective assessment methods are other approaches to assess the quality of data. The objective approach focuses on the evaluation of the stored data by calculating specific quality criteria [21Chen H, Hailey D, Wang N, Yu P. A review of data quality assessment methods for public health information systems. Int J Environ Res Public Health 2014; 11(5): 5170-207. [http://dx.doi.org/10.3390/ijerph110505170] [PMID: 24830450] , 22Pipino L, Wang R, Kopcso D, Rybolt W. Developing measurement scales for data-quality dimensions. Inform Qual 2005; 1: 37-52. ], the subjective approach, reflects the requirements of the beneficiaries [data collectors, administrators, and data users] and their understanding and expectations of using the data. This approach is a supportive method for the objective assessment of data quality and investigates data quality and its dimensions in a real world setting [23Freestone D, Williamson D, Wollersheim D. Geocoding coronial data: tools and techniques to improve data quality. Health Inf Manag 2012; 41(3): 4-12. [http://dx.doi.org/10.1177/183335831204100301] [PMID: 23087078] ]. In 2014, Chen et al. conducted a systematic review of data quality assessment methods in public health information systems. 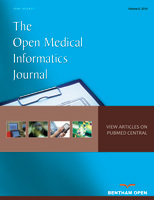 The researchers noted that public health information systems whether paper or computer-based, are the repositories of public health data and their data are frequently used to monitor public health outcomes [21Chen H, Hailey D, Wang N, Yu P. A review of data quality assessment methods for public health information systems. Int J Environ Res Public Health 2014; 11(5): 5170-207. [http://dx.doi.org/10.3390/ijerph110505170] [PMID: 24830450] ]. However, as noted before, the context of emergency medical services is different and the quality of data is pivotal at the point of care. Even a small delay in retrieving health care information makes that information essentially useless for emergency care [24Finnell JT, Overhage JM, McDonald CJ, Eds. In support of emergency department health information technology. AMIA Annual Symposium Proceedings 2005.]. While there are a wide variety of electronic systems with different functionalities available for use in emergency medical services, these variations may affect physicians' decision-making, clinicians' workflow, communication, and the overall quality of care and patient safety [8Farley HL, Baumlin KM, Hamedani AG, et al. Quality and safety implications of emergency department information systems. Ann Emerg Med 2013; 62(4): 399-407. [http://dx.doi.org/10.1016/j.annemergmed.2013.05.019] [PMID: 23796627] ]. Moreover, the study conducted by Chen et al. was general and the concept of data quality in the context of emergency medical services was not discovered in particular [21Chen H, Hailey D, Wang N, Yu P. A review of data quality assessment methods for public health information systems. Int J Environ Res Public Health 2014; 11(5): 5170-207. [http://dx.doi.org/10.3390/ijerph110505170] [PMID: 24830450] ]. In the current study, the researchers aimed to identify the assessment approaches, the main dimensions of data quality and the status of data quality in the emergency medical services. All of the review and research papers related to data quality assessment in the emergency medical services published between 2000 and 2015 were included in the study. The non-English papers, books and editorial letters were excluded. Initially, 1038 papers were retrieved of which 420 duplicated papers were removed by using EndNote X7 software. The remaining 618 papers were screened based on titles, abstracts, and the relevance to the study subject. At this stage, 56 relevant full text papers were identified. 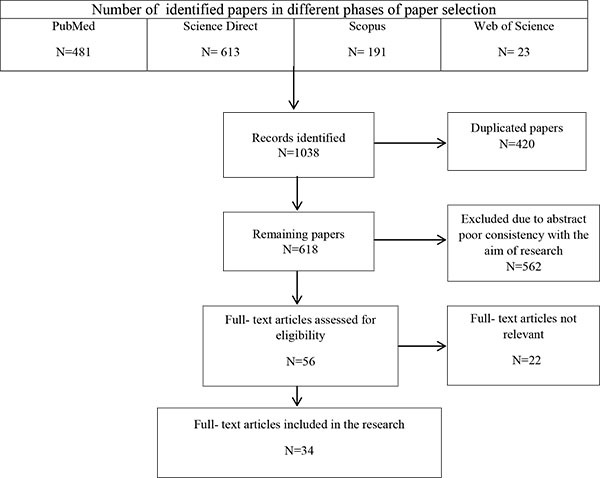 Having read the papers, finally, 34 articles were selected to be reviewed (Fig. 1 ). Two researchers (MM) and (HA) involved in the process of paper selection and the results were discussed with the third researcher (DKZ). For each paper, information about the author, publication year, study objectives, data quality dimensions, methodology, and a summary of findings were extracted. The process of selecting papers for the research. Among 34 selected papers, 32 articles were published in the journals and two articles were presented in conferences. Nineteen articles were published between 2010 and 2015. Published papers were from the following countries: USA (21 papers), Australia (eight papers), England (two papers), Norway (one paper), Saudi Arabia (one paper), Canada (one paper). In the following sections, more details about the selected papers are presented. The primary objective of all articles was to assess the quality of data; however, some of them set some secondary objectives, too. For instance, some papers investigated the quality of data and its impact on preparing guidelines to support clinical [25Aronsky D, Haug PJ. Assessing the quality of clinical data in a computer-based record for calculating the pneumonia severity index. J Am Med Inform Assoc 2000; 7(1): 55-65. [http://dx.doi.org/10.1136/jamia.2000.0070055] [PMID: 10641963] ] and managerial judgements [26Dawson SL, Baker T, Salzman S. Small rural emergency services can electronically collect accurate episode-level data: A cross-sectional study. Aust J Rural Health 2015; 23(2): 107-11. [http://dx.doi.org/10.1111/ajr.12154] [PMID: 25818915] ], the concordance of trauma registry and hospital records [27McKenzie K, Walker S, Besenyei A, Aitken LM, Allison B. Assessing the concordance of trauma registry data and hospital records. Health Inf Manag 2005; 34(1): 3-7. [PMID: 18239222] ], functional parameters in the emergency care services [28Ward MJ, Self WH, Froehle CM. Effects of common data errors in electronic health records on emergency department operational performance metrics: A Monte Carlo simulation. Acad Emerg Med 2015; 22(9): 1085-92. [http://dx.doi.org/10.1111/acem.12743] [PMID: 26291051] ], and designing a dashboard for the emergency department [29Koronios A, Gao J. Data quality for emergency department BI dashboard. Proceedings of the 1st International Conference on E-Business Intelligence (ICEBI2010) 2010. [http://dx.doi.org/10.2991/icebi.2010.47] ] (Table 1). In four studies, data quality assessment was conducted based on the work processes and the flow of information [29Koronios A, Gao J. Data quality for emergency department BI dashboard. Proceedings of the 1st International Conference on E-Business Intelligence (ICEBI2010) 2010. [http://dx.doi.org/10.2991/icebi.2010.47] -31Gao J, Koronios A, Choi E-S. Assessing data quality issues in the Emergency Department through data and process mapping. ACIS 2012: Location, location, location: Proceedings of the 23rd Australasian Conference on Information Systems, 3-5 Dec 2012; ACIS.] and some others examined the effect of interventions on the quality of data. Three studies were performed to introduce new techniques for assessing the quality of data. These techniques included simulation [phenomenology] [28Ward MJ, Self WH, Froehle CM. Effects of common data errors in electronic health records on emergency department operational performance metrics: A Monte Carlo simulation. Acad Emerg Med 2015; 22(9): 1085-92. [http://dx.doi.org/10.1111/acem.12743] [PMID: 26291051] ], and narrative texts analysis [32Jones SJ, Lyons RA. Routine narrative analysis as a screening tool to improve data quality. Inj Prev 2003; 9(2): 184-6. [http://dx.doi.org/10.1136/ip.9.2.184] [PMID: 12810750] ]. A number of papers assess the quality of data to determine information gaps. In these papers, completeness, accessibility of information, and documentation errors were the main areas to be assessed [33Brice JH, Friend KD, Delbridge TR. Accuracy of EMS-recorded patient demographic data. Prehosp Emerg Care 2008; 12(2): 187-91. [http://dx.doi.org/10.1080/10903120801907687] [PMID: 18379915] -39Stiell A, Forster AJ, Stiell IG, van Walraven C. Prevalence of information gaps in the emergency department and the effect on patient outcomes. CMAJ 2003; 169(10): 1023-8. [PMID: 14609971] ]. Summary of the reviewed papers. In two articles, a data quality assessment model was presented and discussed. According to this model, data quality assessment can be conducted with respect to three dimensions which are technical, organizational and individual [29Koronios A, Gao J. Data quality for emergency department BI dashboard. Proceedings of the 1st International Conference on E-Business Intelligence (ICEBI2010) 2010. [http://dx.doi.org/10.2991/icebi.2010.47] , 31Gao J, Koronios A, Choi E-S. Assessing data quality issues in the Emergency Department through data and process mapping. ACIS 2012: Location, location, location: Proceedings of the 23rd Australasian Conference on Information Systems, 3-5 Dec 2012; ACIS.]. Although most papers had assessed the quality of data in the emergency departments, a few papers had focused on the quality of data in pre-hospital emergency care services [33Brice JH, Friend KD, Delbridge TR. Accuracy of EMS-recorded patient demographic data. Prehosp Emerg Care 2008; 12(2): 187-91. [http://dx.doi.org/10.1080/10903120801907687] [PMID: 18379915] , 40Downing A, Wilson R, Cooke M. Linkage of ambulance service and accident and emergency department data: A study of assault patients in the west midlands region of the UK. Injury 2005; 36(6): 738-44. [http://dx.doi.org/10.1016/j.injury.2004.12.045] [PMID: 15910826] -43Sundermann ML, Salcido DD, Koller AC, Menegazzi JJ. Inaccuracy of patient care reports for identification of critical resuscitation events during out-of-hospital cardiac arrest. Am J Emerg Med 2015; 33(1): 95-9. [http://dx.doi.org/10.1016/j.ajem.2014.10.037] [PMID: 25456340] ]. Having reviewed the literature it was revealed that among different dimensions of data quality, five dimensions have received more attention in healthcare. These dimensions were accuracy, timeliness, completeness, relevancy, and consistency [44Liaw S-T, Rahimi A, Ray P, et al. Towards an ontology for data quality in integrated chronic disease management: a realist review of the literature. Int J Med Inform 2013; 82(1): 10-24. [http://dx.doi.org/10.1016/j.ijmedinf.2012.10.001] [PMID: 23122633] ]. The definitions of these dimensions are presented in Table 2. - Definition of dimensions of data quality. In the current study, the findings showed that in the emergency care services, the main dimensions of data quality were completeness, accuracy, consistency, accessibility, and timeliness. According to Table 3, all papers had investigated one or more dimensions of data quality. Data quality dimensions and their related characteristics in the reviewed papers. Interestingly, the results showed that the definitions of data quality dimensions were occasionally different in various studies. For instance, terms like missing, incompleteness, information gap, and omission were used to address the completeness dimension in some studies and invalid values were regarded as missing data (incompleteness) in one study [45Gorelick MH, Alpern ER, Singh T, et al. Availability of pediatric emergency visit data from existing data sources. Acad Emerg Med 2005; 12(12): 1195-200. [http://dx.doi.org/10.1197/j.aem.2005.06.028] [PMID: 16282514] ] Similarly, the lack of common understanding among researchers and differences in definitions could be seen in other data quality dimensions, such as accuracy, consistency and accessibility. The objective or quantitative methods were the most common method used to assess the quality of data. Among quantitative methods (e.g., retrospective, cross-sectional survey), retrospective and cross-sectional studies with statistical data were the most common ones. The subjective or qualitative methods (including review of publications and documentations, interviews with key informants, and field observations) were used only in four papers [12Xie S, Helfert M. Assessing information quality deficiencies in emergency medical service performance. Proceedings of international conference on information quality Cambridge. 2010.2010., 29Koronios A, Gao J. Data quality for emergency department BI dashboard. Proceedings of the 1st International Conference on E-Business Intelligence (ICEBI2010) 2010. [http://dx.doi.org/10.2991/icebi.2010.47] , 31Gao J, Koronios A, Choi E-S. Assessing data quality issues in the Emergency Department through data and process mapping. ACIS 2012: Location, location, location: Proceedings of the 23rd Australasian Conference on Information Systems, 3-5 Dec 2012; ACIS., 58Murphy AR, Reddy MC. Identification and management of information problems by emergency department staff. AMIA Annu Symp Proc 2014; 2014: 1845-54. [PMID: 25954457] ], and the mixed methods [quantitative and qualitative] were applied in three studies to assess the quality of emergency medical services data [37Hunt PR, Hackman H, Berenholz G, McKeown L, Davis L, Ozonoff V. Completeness and accuracy of International Classification of Disease (ICD) external cause of injury codes in emergency department electronic data. Inj Prev 2007; 13(6): 422-5. [http://dx.doi.org/10.1136/ip.2007.015859] [PMID: 18056321] , 46Porter SC, Manzi SF, Volpe D, Stack AM. Getting the data right: information accuracy in pediatric emergency medicine. Qual Saf Health Care 2006; 15(4): 296-301. [http://dx.doi.org/10.1136/qshc.2005.017442] [PMID: 16885256] , 47Remen VM, Grimsmo A. Closing information gaps with shared electronic patient summaries: How much will it matter? Int J Med Inform 2011; 80(11): 775-81. [http://dx.doi.org/10.1016/j.ijmedinf.2011.08.008] [PMID: 21956001] ]. In these articles, the quantitative methods had been used to measure the dimensions, and the qualitative methods had been utilized to investigate users’ perspectives about the quality of data or the main reasons for the information gap. The results of the studies could be categorized in three categories. The first category was related to assessing different dimensions of data quality and the following findings were reported by the researchers: completeness (between 30% and 100%), accuracy (between 57% and 99%), consistency (between 54% and 98%), accessibility (between 50% and 98.7%) and data errors were found in timestamps [28Ward MJ, Self WH, Froehle CM. Effects of common data errors in electronic health records on emergency department operational performance metrics: A Monte Carlo simulation. Acad Emerg Med 2015; 22(9): 1085-92. [http://dx.doi.org/10.1111/acem.12743] [PMID: 26291051] , 48Ward MJ, Froehle CM, Hart KW, Lindsell CJ. Operational data integrity during electronic health record implementation in the ED. Am J Emerg Med 2013; 31(7): 1029-33. [http://dx.doi.org/10.1016/j.ajem.2013.03.027] [PMID: 23707000] , 49Travers D, Barnett C, Ising A, Waller A. Timeliness of emergency department diagnoses for syndromic surveillance. Proceeding of AMIA Annual Symposium 2006.]. The second category was related to the studies in which an intervention was performed to improve data quality. In this category, different approaches, such as simulation (phenomenology) [28Ward MJ, Self WH, Froehle CM. Effects of common data errors in electronic health records on emergency department operational performance metrics: A Monte Carlo simulation. Acad Emerg Med 2015; 22(9): 1085-92. [http://dx.doi.org/10.1111/acem.12743] [PMID: 26291051] ] and data linkage [40Downing A, Wilson R, Cooke M. Linkage of ambulance service and accident and emergency department data: A study of assault patients in the west midlands region of the UK. Injury 2005; 36(6): 738-44. [http://dx.doi.org/10.1016/j.injury.2004.12.045] [PMID: 15910826] ] were used to improve data quality. Some researchers examined the effect of interventions on the quality of data. The interventions included the use of a structured encounter form for documentation [50Kanegaye JT, Cheng JC, McCaslin RI, Trocinski D, Silva PD. Improved documentation of wound care with a structured encounter form in the pediatric emergency department. Ambul Pediatr 2005; 5(4): 253-7. [http://dx.doi.org/10.1367/A04-196R.1] [PMID: 16026193] ], the use of a standardized patient transfer form [35Cwinn MA, Forster AJ, Cwinn AA, Hebert G, Calder L, Stiell IG. Prevalence of information gaps for seniors transferred from nursing homes to the emergency department. CJEM 2009; 11(5): 462-71. [http://dx.doi.org/10.1017/S1481803500011660] [PMID: 19788791] , 51Dalawari P, Duggan J, Vangimalla V, Paniagua M, Armbrecht ES. Patient transfer forms enhance key information between nursing homes and emergency department. Geriatr Nurs 2011; 32(4): 270-5. [http://dx.doi.org/10.1016/j.gerinurse.2011.05.001] [PMID: 21816282] ], a patient-centred health information technology (a mobile kiosk) [7Porter SC, Forbes P, Manzi S, Kalish LA. Patients providing the answers: narrowing the gap in data quality for emergency care. Qual Saf Health Care 2010; 19(5): e34. [PMID: 20511242] ], the use of Electronic Health Records (EHR) [48Ward MJ, Froehle CM, Hart KW, Lindsell CJ. Operational data integrity during electronic health record implementation in the ED. Am J Emerg Med 2013; 31(7): 1029-33. [http://dx.doi.org/10.1016/j.ajem.2013.03.027] [PMID: 23707000] ], the use of vital signs data recorder [VSDR] technology in pre-hospital care [52Hu P, Galvagno SM Jr, Sen A, et al. Identification of dynamic prehospital changes with continuous vital signs acquisition. Air Med J 2014; 33(1): 27-33. [http://dx.doi.org/10.1016/j.amj.2013.09.003] [PMID: 24373474] ], electronic documentation [53Coffey C, Wurster LA, Groner J, et al. A comparison of paper documentation to electronic documentation for trauma resuscitations at a level I pediatric trauma center. J Emerg Nurs 2015; 41(1): 52-6. [http://dx.doi.org/10.1016/j.jen.2014.04.010] [PMID: 24996509] ], and narrative texts analysis [32Jones SJ, Lyons RA. Routine narrative analysis as a screening tool to improve data quality. Inj Prev 2003; 9(2): 184-6. [http://dx.doi.org/10.1136/ip.9.2.184] [PMID: 12810750] ]. One study applied educational interventions to develop documentations [34Considine J, Potter R, Jenkins J. Can written nursing practice standards improve documentation of initial assessment of ED patients? Australas Emerg Nurs J 2006; 9(1): 11-8. [http://dx.doi.org/10.1016/j.aenj.2006.03.004] ] and one study examined the role of pharmacists in identifying discrepancies in medication histories [54Abuyassin BH, Aljadhey H, Al-Sultan M, Al-Rashed S, Adam M, Bates DW. Accuracy of the medication history at admission to hospital in Saudi Arabia. Saudi Pharm J 2011; 19(4): 263-7. [http://dx.doi.org/10.1016/j.jsps.2011.04.006] [PMID: 23960767] ]. The third category was related to the papers which focused on the data quality issues in the emergency medical services. These issues included information gaps and related causes, data quality and dashboard development projects, data quality issues emerged during data collection and reporting processes, data quality issues from the emergency department staff perspectives. Emergency medicine is an information intensive speciality in which timely access to accurate patient information is of high importance [55Ayatollahi H, Bath PA, Goodacre S. Accessibility versus confidentiality of information in the emergency department. Emerg Med J 2009; 26(12): 857-60. [http://dx.doi.org/10.1136/emj.2008.070557] [PMID: 19934127] ]. Therefore, data quality assessment is necessary in this field. In the current study, papers related to data quality assessment in the field of emergency medical services were reviewed and the results showed that there were different and sometimes ambiguous definitions for data quality dimensions and related characteristics. The results are in line with the findings of other studies conducted by Chen et al. [21Chen H, Hailey D, Wang N, Yu P. A review of data quality assessment methods for public health information systems. Int J Environ Res Public Health 2014; 11(5): 5170-207. [http://dx.doi.org/10.3390/ijerph110505170] [PMID: 24830450] ] and Michnik and Lo [56Michnik J, Lo M-C. The assessment of the information quality with the aid of multiple criteria analysis. Eur J Oper Res 2009; 195(3): 850-6. [http://dx.doi.org/10.1016/j.ejor.2007.11.017] ]. The lack of common understanding among researchers and differences in definitions of data quality dimensions have led to conducting various studies and obtaining different results. For example, in some papers, data availability was regarded as equivalent to completeness [25Aronsky D, Haug PJ. Assessing the quality of clinical data in a computer-based record for calculating the pneumonia severity index. J Am Med Inform Assoc 2000; 7(1): 55-65. [http://dx.doi.org/10.1136/jamia.2000.0070055] [PMID: 10641963] , 45Gorelick MH, Alpern ER, Singh T, et al. Availability of pediatric emergency visit data from existing data sources. Acad Emerg Med 2005; 12(12): 1195-200. [http://dx.doi.org/10.1197/j.aem.2005.06.028] [PMID: 16282514] , 49Travers D, Barnett C, Ising A, Waller A. Timeliness of emergency department diagnoses for syndromic surveillance. Proceeding of AMIA Annual Symposium 2006. ], accessibility [57Hripcsak G, Sengupta S, Wilcox A, Green RA. Emergency department access to a longitudinal medical record. J Am Med Inform Assoc 2007; 14(2): 235-8. [http://dx.doi.org/10.1197/jamia.M2206] [PMID: 17213496] ], and missing data [58Murphy AR, Reddy MC. Identification and management of information problems by emergency department staff. AMIA Annu Symp Proc 2014; 2014: 1845-54. [PMID: 25954457] ]. In one study, conflict was considered equivalent to inconsistency [58Murphy AR, Reddy MC. Identification and management of information problems by emergency department staff. AMIA Annu Symp Proc 2014; 2014: 1845-54. [PMID: 25954457] ], while in another study it was regarded as data omission [54Abuyassin BH, Aljadhey H, Al-Sultan M, Al-Rashed S, Adam M, Bates DW. Accuracy of the medication history at admission to hospital in Saudi Arabia. Saudi Pharm J 2011; 19(4): 263-7. [http://dx.doi.org/10.1016/j.jsps.2011.04.006] [PMID: 23960767] ]. It seems that the definitions and characteristics of the data were different based on the intuition, past experiences, and assessment purposes [21Chen H, Hailey D, Wang N, Yu P. A review of data quality assessment methods for public health information systems. Int J Environ Res Public Health 2014; 11(5): 5170-207. [http://dx.doi.org/10.3390/ijerph110505170] [PMID: 24830450] ]. Therefore, the use of ontology-based or standard definitions in the future studies can help to be able to compare the research methods and the results [21Chen H, Hailey D, Wang N, Yu P. A review of data quality assessment methods for public health information systems. Int J Environ Res Public Health 2014; 11(5): 5170-207. [http://dx.doi.org/10.3390/ijerph110505170] [PMID: 24830450] ]. According to the findings, the most common data quality dimensions assessed in the emergency medical services were completeness, accuracy, and consistency followed by accessibility and timeliness. In EMS, data completeness and data accuracy are important for improving the quality of care and for making right decisions. Similarly, data consistency is important to show the agreement between two or more sources of information and the possibility of data linkage between the primary and secondary care systems [59Liaw ST, Chen HY, Maneze D, et al. Health reform: is routinely collected electronic information fit for purpose? Emerg Med Australas 2012; 24(1): 57-63. [http://dx.doi.org/10.1111/j.1742-6723.2011.01486.x] [PMID: 22313561] ]. The linkage between data sources, in turn, can help to promote the quality of communication and information flow across the healthcare organizations [41Mears GD, Rosamond WD, Lohmeier C, et al. A link to improve stroke patient care: a successful linkage between a statewide emergency medical services data system and a stroke registry. Acad Emerg Med 2010; 17(12): 1398-404. [http://dx.doi.org/10.1111/j.1553-2712.2010.00925.x] [PMID: 21122025] ]. The characteristics of emergency medical services also necessitate information being accessible for treating patients in a timely manner [55Ayatollahi H, Bath PA, Goodacre S. Accessibility versus confidentiality of information in the emergency department. Emerg Med J 2009; 26(12): 857-60. [http://dx.doi.org/10.1136/emj.2008.070557] [PMID: 19934127] ]. It seems that these data quality dimensions can be considered as a data quality framework for emergency medical services (Fig. 2 ). According to Almutiry et al., the existing data quality frameworks are based on literature review, industrial experiences or intuitive understanding and the definition of a dimension may vary from one framework to another [6Almutiry O, Wills G, Alwabel A. Toward a framework for data quality in cloud-based health information system. International Conference on Information Society (i-Society), 24-26 June 2013: IEEE.]. Moreover, the frameworks are too generic to adopt, may not reflect the nature of a domain, or may have some irrelative attributes. Therefore, such a data quality framework for emergency medical services can help to cover the main quality dimensions which are more relevant to the nature of emergency medical services. The proposed data quality framework is more comprehensive than the framework suggested by Chen et al. in which the main data quality dimensions were completeness, accuracy and timeliness [21Chen H, Hailey D, Wang N, Yu P. A review of data quality assessment methods for public health information systems. Int J Environ Res Public Health 2014; 11(5): 5170-207. [http://dx.doi.org/10.3390/ijerph110505170] [PMID: 24830450] ]. 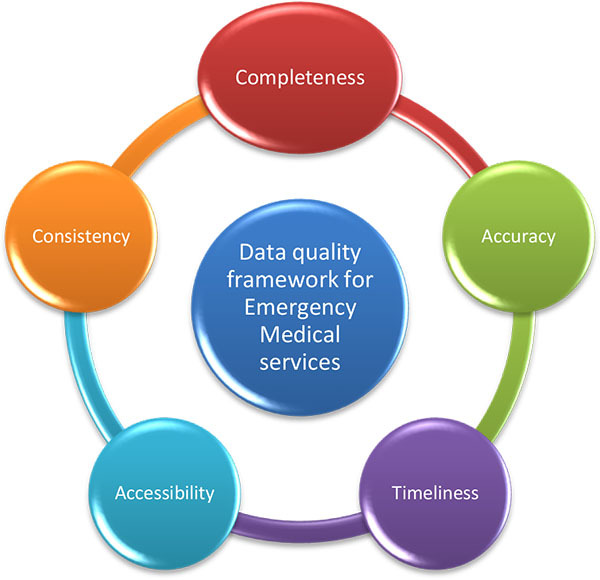 Data quality framework for emergency medical services. Regarding the assessment methods, the findings demonstrated that there was no unique method to assess the quality of emergency medical services data and a variety of research methods was used by the researchers. This is consistent with the findings reported by Chen et al. [21Chen H, Hailey D, Wang N, Yu P. A review of data quality assessment methods for public health information systems. Int J Environ Res Public Health 2014; 11(5): 5170-207. [http://dx.doi.org/10.3390/ijerph110505170] [PMID: 24830450] ]. However, the findings of the current study showed that the use of quantitative research methods had the highest frequency. In these studies, quantitative methods were mainly used to assess data accuracy, data consistency, data completeness, and data availability which are in line with the reported findings in other studies [53Coffey C, Wurster LA, Groner J, et al. A comparison of paper documentation to electronic documentation for trauma resuscitations at a level I pediatric trauma center. J Emerg Nurs 2015; 41(1): 52-6. [http://dx.doi.org/10.1016/j.jen.2014.04.010] [PMID: 24996509] ]. According to the literature, in order to assess different aspects of data quality, objective and subjective methods can be used. However, quality is a very subjective concept and depends on many other factors. As Pipino et al. noted assessing data quality requires the awareness of the fundamental principles and should be assessed by using both subjective and objective data quality metrics [18Pipino LL, Lee YW, Wang RY. Data quality assessment. Commun ACM 2002; 45(4): 211-8. [http://dx.doi.org/10.1145/505248.506010] ]. The use of mixed methods [quantitative and qualitative] and different information resources, such as files, organizational documents, and users' perspectives has also been suggested in other studies [19Batini C, Cappiello C, Francalanci C, Maurino A. Methodologies for data quality assessment and improvement. ACM Comput Surv 2009; 41(3): 16. [http://dx.doi.org/10.1145/1541880.1541883] , 21Chen H, Hailey D, Wang N, Yu P. A review of data quality assessment methods for public health information systems. Int J Environ Res Public Health 2014; 11(5): 5170-207. [http://dx.doi.org/10.3390/ijerph110505170] [PMID: 24830450] , 60Karr AF, Sanil AP, Banks DL. Data quality: A statistical perspective. Stat Methodol 2006; 3(2): 137-73. [http://dx.doi.org/10.1016/j.stamet.2005.08.005] ]. In fact, performing subjective and objective data quality assessments helps to compare the results of the assessments, to identify discrepancies, and to determine root causes of errors for determining and taking necessary actions for improvement [61Angeles P, Garcia-Ugalde F. Assessing data quality of integrated data by quality aggregation of its ancestors. Comp Y Sist 2010; 13(3): 331-44.]. In fact, the subjective assessment is a supplement to the objective assessment and is useful for designing effective strategies for improving data quality [15Watts S, Shankaranarayanan G, Even A. Data quality assessment in context: A cognitive perspective. Decis Support Syst 2009; 48(1): 202-11. [http://dx.doi.org/10.1016/j.dss.2009.07.012] , 21Chen H, Hailey D, Wang N, Yu P. A review of data quality assessment methods for public health information systems. Int J Environ Res Public Health 2014; 11(5): 5170-207. [http://dx.doi.org/10.3390/ijerph110505170] [PMID: 24830450] , 22Pipino L, Wang R, Kopcso D, Rybolt W. Developing measurement scales for data-quality dimensions. Inform Qual 2005; 1: 37-52., 62Redman TC. Measuring data accuracy: A framework and review.Information quality 2005; 21-36.]. The results also revealed that the quality of data could be affected by a number of technical, organizational, and individual factors [31Gao J, Koronios A, Choi E-S. Assessing data quality issues in the Emergency Department through data and process mapping. ACIS 2012: Location, location, location: Proceedings of the 23rd Australasian Conference on Information Systems, 3-5 Dec 2012; ACIS., 48Ward MJ, Froehle CM, Hart KW, Lindsell CJ. Operational data integrity during electronic health record implementation in the ED. Am J Emerg Med 2013; 31(7): 1029-33. [http://dx.doi.org/10.1016/j.ajem.2013.03.027] [PMID: 23707000] , 53Coffey C, Wurster LA, Groner J, et al. A comparison of paper documentation to electronic documentation for trauma resuscitations at a level I pediatric trauma center. J Emerg Nurs 2015; 41(1): 52-6. [http://dx.doi.org/10.1016/j.jen.2014.04.010] [PMID: 24996509] ]. Since, these factors may also influence data accessibility, they should be taken into account when designing information systems [55Ayatollahi H, Bath PA, Goodacre S. Accessibility versus confidentiality of information in the emergency department. Emerg Med J 2009; 26(12): 857-60. [http://dx.doi.org/10.1136/emj.2008.070557] [PMID: 19934127] ]. Overall, different studies showed that technical factors, such as ED information system user-interface and data extracting methods may influence the timiliness, accuracy, and completeness of data, while data consistency and data integrity are mainly affected by the organizational factors (e.g., waiting time) and individual factors (e.g., capturing all required data from patients] [29Koronios A, Gao J. Data quality for emergency department BI dashboard. Proceedings of the 1st International Conference on E-Business Intelligence (ICEBI2010) 2010. [http://dx.doi.org/10.2991/icebi.2010.47] , 31Gao J, Koronios A, Choi E-S. Assessing data quality issues in the Emergency Department through data and process mapping. ACIS 2012: Location, location, location: Proceedings of the 23rd Australasian Conference on Information Systems, 3-5 Dec 2012; ACIS.]. The results showed to improve the quality of data in emergency medical services, different interventions can be made; however, most studies have used different types of health information technologies and structured forms. This shows that technical factors and information systems can be replaced with the traditional paper-based records; however, they need to be designed and implemented carefully as the quality of data can be easily affected by the quality of these system [55Ayatollahi H, Bath PA, Goodacre S. Accessibility versus confidentiality of information in the emergency department. Emerg Med J 2009; 26(12): 857-60. [http://dx.doi.org/10.1136/emj.2008.070557] [PMID: 19934127] ]. Overall, it can be concluded that data quality in emergency medical services deserves more attention, scientific research and investment. The data quality framework propsed in the current study can be used in different settings of emergnecy medical services to compare the quality of data and to understand how to improve the current situations. Moreover, it is a simple and clear framework which can be easily used by the health care practitioners in the field to examine the quality of data in their own settings. The results of this type of research can also help to develop better quality assurance strategies, to support health care delivery, and to improve patient care. Emergency medical services require high quality data to support healthcare delivery and decision making and data quality assessment is of great importance in this field. The results of the current study showed that due to the diversity of definitions and terminology used to assess the dimensions, characteristics, and attributes of data quality, comparing findings reported in different studies was difficult. Therefore, in the future studies, more attention should be paid to choose a clear and a consistent definition of data quality. In this study, a data quality framework was proposed to be used in the context of emergency medical services. The main data quality dimensions were completeness, accuracy, consistency, accessibility and timeliness. This framework shows that data consistency and data accessibility are two important quality dimensions for emergency medical services in addition to data completeness, accuracy and timeliness. Regarding the data quality assessment methods, the use of qualitative research methods or the mixed methods is suggested, because data users’ perspectives can provide a broader picture of data quality and related issues. Finally, emergency data quality needs to be assessed at different organizational levels using different resources. This approach can help to identify quality issues and the most appropriate interventions to improve data quality. This study was funded and supported by Iran University of Medical Sciences, Tehran, Iran (IUMS/SHMIS_93/10). Haug A, Zachariassen F, Van Liempd D. The costs of poor data quality. Indust Engg Manag 2011; 4(2): 168-93. Carey M, Ceri S, Bernstein P, et al. Data-centric Systems and Applications 2006. Sebastian-Coleman L. Measuring data quality for ongoing improvement: a data quality assessment framework 2013. Almutiry O, Wills G, Alwabel A. Toward a framework for data quality in cloud-based health information system. International Conference on Information Society (i-Society), 24-26 June 2013: IEEE. Esmailian M, Nasr-Esfahani M, Brahimi AS. The quality of patients’ files documentation in emergency department: A cross-sectional study. Iranian Journal of Emergency Medicine 2014; 1(1): 16-21. Xie S, Helfert M. Assessing information quality deficiencies in emergency medical service performance. Proceedings of international conference on information quality Cambridge. 2010.2010. Liaw S-T, Chen H-Y, Maneze D, et al. The quality of routinely collected data: Using the “principal diagnosis” in emergency department databases as an example. Electr J Health Inform 2012; 7(1): 1. Faridaalaee G, Boushehri B, Mohammadi N, Safari O. Evaluating the quality of multiple trauma patient records in the emergency department of Imam Khomeini hospital in Urmia. Iran J Emerg Medi 2015; 2(2): 88-92. Canadian Institute for Health Information. The CIHI Data Quality Framework 2009. Pipino L, Wang R, Kopcso D, Rybolt W. Developing measurement scales for data-quality dimensions. Inform Qual 2005; 1: 37-52. Finnell JT, Overhage JM, McDonald CJ, Eds. In support of emergency department health information technology. AMIA Annual Symposium Proceedings 2005. Gao J, Koronios A, Choi E-S. Assessing data quality issues in the Emergency Department through data and process mapping. ACIS 2012: Location, location, location: Proceedings of the 23rd Australasian Conference on Information Systems, 3-5 Dec 2012; ACIS. Travers D, Barnett C, Ising A, Waller A. Timeliness of emergency department diagnoses for syndromic surveillance. Proceeding of AMIA Annual Symposium 2006. Angeles P, Garcia-Ugalde F. Assessing data quality of integrated data by quality aggregation of its ancestors. Comp Y Sist 2010; 13(3): 331-44. Redman TC. Measuring data accuracy: A framework and review.Information quality 2005; 21-36.